Entrepreneurs that are of faith are not uncommon. Some are bold in their declaration and others are not as obvious in sharing their faith. However, social media has given all of us the opportunity for global influence right at our fingertips. And as an entrepreneur of faith, you have a responsibility to share your light in a world that so desperately needs a way out of their darkness. The need for us to utilize our businesses as a lighthouse spans from impacting souls that are in darkness to those that have allowed life’s battle to thrust them in a dark hole and are lost without hope. 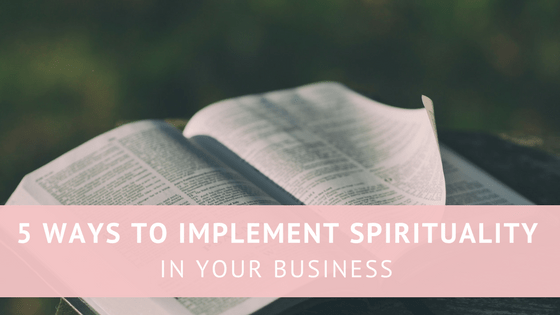 We’re admonished in scripture to “let your light so shine before men (and women) that they may see your good works and glorify our Father in Heaven.” It’s time for all things sacred to connect with the secular and incorporating faith into business is one way. As a person who loves quotes, the bible is filled with thought-provoking, life-changing and transforming messages that can turn into quotes in the form of mantras all throughout the scriptures. These verses can be applied to business, relationships, family and of course your soul. Why not share a verse of the bible that has impacted your life, caused you to adopt a new mindset or that is responsible for the way you conduct yourself in every aspect of your life? You can share with others in a post, as a status update, in your blogs and even in your videos. If you make it relevant to the point you’re making, your message will come across that more meaningful. I have a few and it’s difficult to choose just one. But right away, one of the first verses I adopted was I Tim. 4:12 “Let no one despise your youth, but be an example to the believers in word, in conduct, in love, in spirit, in faith, in purity.” I was 13 years old and the leader of my youth ministry. I often found comfort in this verse because it reminded me that I was not too young to lead as long as I was letting God be my guide. Now that I’m older, I realize that this verse can also be used for those who may feel they don’t have enough experience to step out and do what it is in their heart to do. Take comfort in knowing that you’re called to be an example of what God has put in your heart or of the call that He has placed on your life. Be that example. God will quiet those who think you are not ready. I recently saw an ad for Evian Spring Water with these words in small print “Your body is the temple of your spirit”. I’m not sure what the marketing department of Evian thinks about God and spirituality but in Christiandom there is a lot of significance placed between water and the spirit. Effortlessly and in a non-intrusive way, this company is highlighting the need for our temple and our spirit to be aligned and how it’s all based on what we put into it. If that’s not bible, then I don’t know what is. Sure enough, 1 Corinthians 6:19-20 does remind us that our bodies are a temple where the Spirit dwells and that we are to honor God with our bodies. Do you see the similarities between that scripture and the slogan in Evian Spring water? Think about your own products or services. What kind of title, topic or slogan can you implement that will cause individuals to stop and consider their spiritual health and divine existence? You can include spiritual marketing in the bio section on your social media platforms and be as bold as you like or in a subtle manner as well. For example, I’ve seen individuals use terms like believer, faithpreneur, God-Fearing Wife, Jesus Girl. Mine says “About Faith.” Simple. To the Point. Impactful. I also made an effort to do that in my new book “Spirit Check: Practical Solutions for Emotional Mastery”. Although not targeted to only people of faith, in my book I incorporate several bible examples and stories to provide practical steps for controlling where our thoughts and feelings lead us. Every effort that is based on any solution, is traced by to God. I can’t recall where I first saw it but the quote “Fight with faith or die from fear” has been with me since I was a senior in high school. It was during the time of submitting our photos, acknowledgements, and quotes for our senior page of the yearbook and that was the quote I chose. Little did I know that it would be my constant reminder to show up in life and be obedient to the call on my life despite my inward sense of fear. I’ve used it whenever I was about to embark on something bigger than myself. Every time I have whispered it or said it out loud, somehow the confidence I needed always manifested within me. Is there a spiritual quote that you can adopt that will carry you through your various experiences in life and in business? This needs to be a quote that will speak to your soul and provide the guidance you need for challenges and obstacles that you will inadvertently face. For example “Do unto others in business as you would have done unto you.” There. That will work. Now place it somewhere that will remind you to keep centered and focused when distractions and detours are plaguing your productivity. Service is in my blood. My parents have served parishioners since as far back as I can remember. I began taking ownership of the responsibility to give back as early as my teens when I became youth leader for my house of worship. It was there that I know God developed certain characteristics, mindset and spiritual attributes that I see manifested in my life today. So when I founded The Persona Program in 2007 for girls 7 – 18 years old, it was just an extension of what I’ve always done. Servitude teaches you how to remain grateful for what you have. It connects you to people on a higher level. Additionally, you put yourself in a position to receive blessings and favor in and over your life that you would not have access to, had you not open up your heart and hands to receive it. The Marriott Hotels dedicate a day of service to hotels. You too can serve your community. Volunteer your time. Allocate a certain amount of hours each year. This can be once a year, over the course of a holiday or perpetually. Donate your money to causes that you believe in. This is what you call paying it back. Every single time I pour into a girl through The Persona Program, it is my way of investing into my own children’s future and I’m also nourishing the little girl inside of me. This is how I maintain fulfillment. Finally, serving your community can be as simple as doing something special for those who have invested in your services or products. Be creative and get inspired. I promise it will lift your spirit. In one of my first sessions with a business coach, I was told to write down my core values. Prior, I had not given much thought to a value system and for the most part, I was just living them but not really focused on them. As time has passed, I have come to understand that faith is a core value just as integrity. Examine your faith. Is it limited to spiritual things or have you allowed God to extend the truth of faith works in your business and all other aspects of your life? Increase your faith and apply it not only to when you attend your house of worship but also as you produce and create, knowing that it is because of your faith that you will reap a harvest and see success in your work. Michelle Collins is a Speaker, Author and Mentor. Her quest is for entrepreneurs of faith to stay connected spiritually, while they are building their business, brand and life. She is the Author of “Spirit Check: Practical Solutions for Emotional Mastery” which helps the reader identify the emotion or character flaw that hinders personal, professional or spiritual success and provides answers for mastering emotions in order to deactivate the negative. She is also Founder and Program Director of The Persona Program, a youth organization for girls 7-18 where she develops Confidence, builds Character and promotes proper Conduct through programs and events. A wife and mother, she resides in Southern California with her family.